Pastry looms large in Wes Anderson’s The Grand Budapest Hotel, the product of Mendl’s, the most sublime bakery of all in the kingdom of Zubrowka, its treats packaged in pretty pink boxes. In a way, those baked goods stand as symbols of the whole movie: absolutely gorgeous, irresistible and completely delicious. Set in two opposing eras—the opulent years between the two world wars and the drabness of the Cold War—The Grand Budapest Hotel is Anderson’s most ambitious work to date, evident in his attention to every detail. It is hilarious, but also a film of great heart as he once more visits the relationship between a father and a son. Or a faux father and a son, as the case may be. 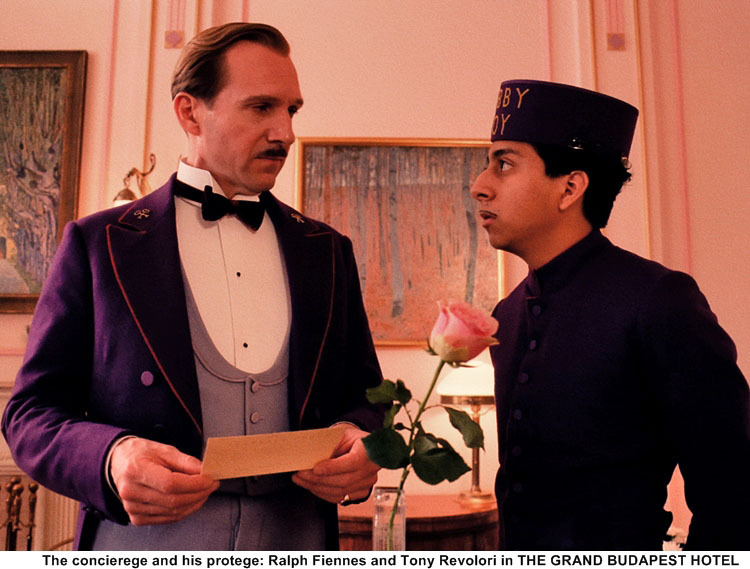 Like Bill Murray and Jason Schwartzman in Rushmore, Grand Budapest Hotel concierge M. Gustave (Ralph Fiennes) and his new lobby boy Zero (Tony Revolori) are not related. Yet, once the older man takes the teenager under his wing, it doesn’t take long for that relationship to develop. It seems unlikely at the outset. M. Gustave is an excellent concierge, always willing to provide extra service to his guests—particularly the elderly ladies—but he is also vain, imperious and shallow. If he barely noticed Zero at all, it would be unsurprising. Instead, he responds to the boy’s loyalty, respect and work ethic. By the time, aged Madame D. (Tilda Swinton) dies, earning M. Gustave the enmity of her vicious son Dmitri (Adrien Brody) when she remembers the concierge in her will, M. Gustave and Zero share a solid bond. Nothing can break it, not Dmitri’s machinations, separation or even a fascist invasion. It is the elderly Zero (F. Murray Abraham), the 1960s-era owner of the Grand Budapest—now long gone to seed—who tells the story to a curious guest, a writer (Jude Law). In the old man’s memories, his youth is almost a fairy tale. Certainly, Zubrowka resembles someplace out of a fable, its luxury exaggerated, the hotel exterior and the mountains surrounding it made of miniatures. At key points, Anderson turns to Fantastic Mr. Fox-style animation. Adam Stockhausen’s (Moonrise Kingdom) production design is exquisite. Anderson’s films are always jewels, but The Grand Budapest Hotel is the most glittering one of them all. A huge ensemble populates Zubrowka, including Murray, Schwartzman, Jeff Goldblum, Willem Dafoe, Léa Seydoux, Mathieu Amalric, Saorise Ronan and Edward Norton, yet it is an intimate comedy, focused on Fiennes and Revolori. The movie is a gift to Fiennes, an actor whose looks and manner have stood him well in such films as Quiz Show, The English Patient, The End of the Affair and his own recent The Invisible Woman. He was built for period pieces and The Grand Budapest Hotel hits his sweet spot. Quite possibly th Best Film of 2014.